The Orders section is a part of the Registration Management Tool and allows you to check the list of ordered tickets and perform various actions. Orders: Ticket's unique order number. Buyer Name: Who purchased a ticket. Status: Whether the ticket was refunded or cancelled. Number of Tickets: The number of tickets an attendee purchased. 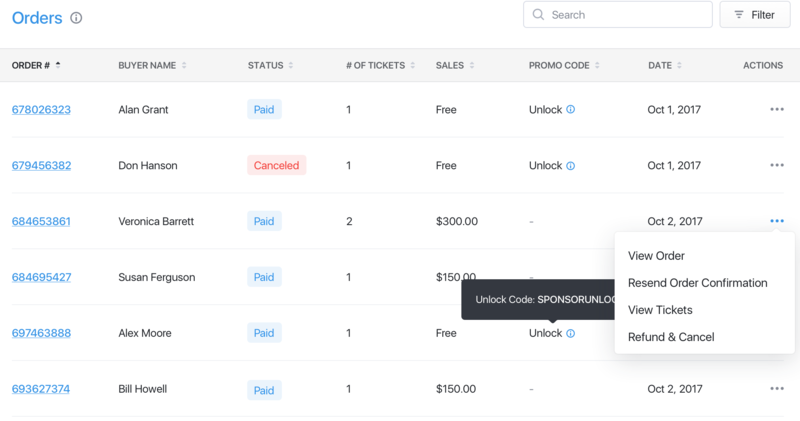 Sales: Whether the ticket is free or paid. Promo Code: Whether a promo code was applied to the ticket (ex. discount). Date: When a ticket was purchased. Actions: You can view details of the order, resend the order confirmation email, review the tickets or refund/cancel the them. By clicking the order number you can see the order details for each order. In the top left you can see the order number, the date and time it was purchased, and the amount of money collected if any. To the right you can see the order summary. This includes the Ticket they purchased, the cost of the ticket, the number of tickets this person purchased, and the cost of the ticket. Beneath that you can see all of the attendee info. This is where you can see the attendee's the ticket was purchased for, their emails and the ticket type for each. 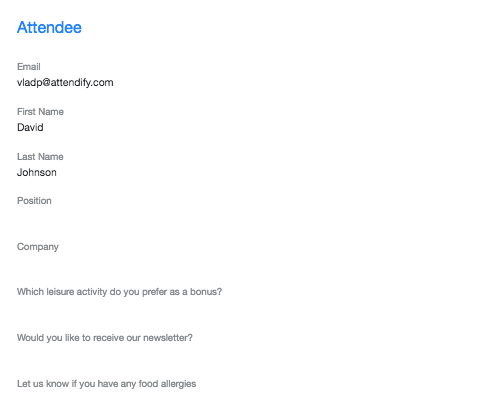 Clicking the "Attendee Info" link will trigger a popup that shows the email, first and last name, their position, company and answers to any other questions that you asked on your checkout forms that were provided during checkout. If you select the three dots under the actions column under the attendees section on the order page you have a few options. 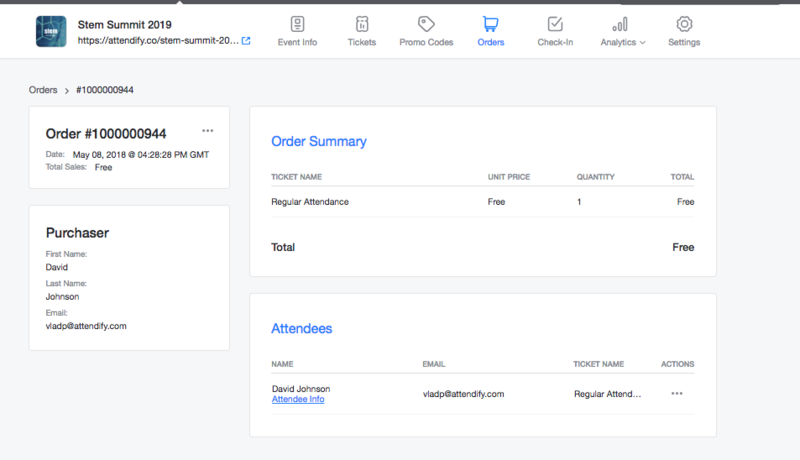 You can resend the order confirmation for the ticket purchase, view the tickets and edit attendee information if you need to.